fwd: Podcasting Your Novel: Publishing's Next Wave? Podcasting Your Novel: Publishing's Next Wave? Fw: Black History Online Literary Affair - going on now! For better viewing as a webpage click here and enjoy! Please join us for 42 nights of fun, wisdom, fellowship, and book previews, as well as author interviews. EDC Creations and the Sankofa Literary Society will host the annual Black History Month Internet Book Fair to bring together book clubs, educators, business leaders, editors, authors, community leaders and concerned citizens. You can participate nightly from the comforts of your home! The event is held totally online with nightly panel discussions, seminars, live readings from new book releases, community town hall meetings and open mic poetry nights. During the day, you can network on the official event blog with other readers. You are invited to take part in this historic 6-week event. Please take a look at our nightly themes and let us know if you would like to be a featured panelist. If you are interested in taking part in the program, please email Ella Curry at: elladcurry@edc-creations.com. Our theme is "Give the Gift of Knowledge." We seek to bring together our modern day Griots to share with us the history of our people and to lead us into the future. Are you ready? Do you want to help us prepare an archive of African American legacies for your children? This is an open, community forum for all races and cultures. We will help create the very foundations of change by exercising unity and generosity. Please share this email with your network too! For more information and to view the nightly themes, click below. Forgive me if this is a duplicate email. My intentions are good and I do apologize. Literary Director for the Environmental Justice League, Inc.
Fw: The Blogger Guide - Sidebar Has Fallen Down! Every now and then, the above problem gets raised on many Blogger forums. Sometimes the request comes in the form of "My sidebar is missing!, please help". First of all, don't panic, it's not catastrophic. If a missing tag is the problem, the following method can be used to identify the post(s) that cause it. Visit the individual pages of each post that appears on your home page. (For example, if you have configured your blog to show five recent posts on the home page, then visit each one of those five) In one (or more) of those posts, the sidebar will be pushed down, while it will appear normal in other posts. These posts are the ones that cause the problem. Once you locate the trouble-making post (or posts), open it in Edit HTML mode and check for any unclosed <div> tags. Add the missing </div> tags and publish the post again. That should bring the sidebar back to its usual position. Though the missing closing tags has been the biggest culprit for fallen sidebars, there are some other, rare reasons such as posting of large pictures or widgets in the sidebar and obscure script errors. If the above method does not fix your problem, then some more investigations are needed to locate the cause. Internet Marketing, Blogging & Social Networking - Getting Your Work to the World! Explore the endless possibilities of selling your work on the Internet and being successful at it. From quick tips on setting up great writer's website, figuring out RSS, to keeping the readers coming back for more! No experience required! At the event, Sylvia Hubbard will make her book, Internet Marketing for Writers and Businesses available for only $5.00, but there will be limited copies. To order your book early at Amazon.com for $6.00 (plus shipping and handling in time for the conference) click here. For better viewing, click here to read this newsletter in a browser. Hello, and a warm welcome to all of my new subscribers! This month's feature article explores ways you can improve your book's placement on the search results page of Amazon.com. In the Recommended Resources section, you'll find information about the new Amazon Author Stores, testing children's books for lead content, publicity for nonfiction books, my new ebook series, and resources for writers. Best wishes for a healthy, happy, and successful year! Amazon.com customers typically search for books by author, title, or keyword. Like search engines, Amazon uses several criteria in deciding which products to display on the search results page and in what order to display them. Popularity (the number of books already sold on Amazon) and how well the book matches the keywords are major factors in determining the results of keyword searches. The more books you sell on Amazon, the more books you will sell in the future, because your book will appear higher in the search results. In addition, many customers assume that the best-selling book must be the best one on the topic. One way to increase your book's "popularity," and therefore its search results placement, is to direct all of your online book orders to Amazon.com. It's also important to make sure your book matches popular search terms entered by customers. If your book is not yet published, you can add important keywords to the book's title and subtitle. Some publishers use long subtitles in order to pack in as many keywords as possible. To capitalize on searches for keywords not contained in your title and subtitle, enter important keywords into Amazon's Search Tag feature. Near the bottom of the Tags section (about halfway down your book page), look for "Help others find this product - tag it for Amazon search" and click on the "suggest" button. You can't use keywords that already appear in Amazon's search function, such as the book title or author name. Word order matters, so create different search tags with variations on your most important keywords. After you enter a keyword, you must to tell Amazon why you think the book should be indexed under that particular term. Amazon staff members approve Search Tags, so make sure your tag and your explanation are relevant and don't sound like a sales pitch. It's best to use the keyword phrase within your explanation. You can personally submit up to ten search terms for you book. If you have additional search terms to enter, ask a colleague to enter some for you. Another way to increase your "popularity" on Amazon.com is do a virtual book tour or an "Amazon best-seller campaign," designed to push up your Amazon sales rank by generating a large number of orders on a single day. There are a number of other ways to promote your book on Amazon.com, including getting lots of good Amazon reviews, writing reviews of other related books, participating in the Look Inside program, creating an Amazon Connect blog, enhancing your book description, participating in Amazon forums for your book's topic, and creating Listmania lists and So You'd Like To guides. For a more in-depth look at Amazon promotions, I recommend Aiming at Amazon, by Aaron Shepard. Amazon.com has launched a new feature called Author Stores. Right now it's in beta testing, by invitation only. Visit this page for more details, and get on the mailing list to receive information from Amazon. The new consumer safety law requiring that children's books be tested for lead content is causing problems for publishers, printers, and booksellers. SPAN has compiled a web page with helpful information on this issue. See this article for some terrific publicity tips from publicist Sandra Beckwith. For a step-by-step guide to creating publicity materials, I recommend Sandra's ebook, Publicity Forms & Templates. The Savvy Book Marketer Guides is a new series of step-by-step ebooks designed to help authors and independent publishers master specific book marketing strategies. The first two titles, Selling to Libraries and Successful Social Marketing, will be available in mid-February. Stay tuned for details. I'm pleased to report that my Book Marketing Maven blog was awarded the "Truly Useful Site" award from Preditors & Editors this month. Check out their site for a long list of resources for writers. As a special thank you to my readers and subscribers, I've compiled a free ebook, Top Book Marketing Tips of 2008, featuring a collection of popular articles from the Book Marketing Maven blog and The Savvy Book Marketer newsletter. If you haven't already done so, downloaded your copy here. You're welcome to pass this ebook on to others. As a book marketing coach, I specialize in developing targeted marketing plans for nonfiction books. See my Book Marketing Maven blog for more book promotion tips. If you enjoyed this newsletter, please share it with another author or publisher. Thanks! Given below is a categorized list of HOWTOs available on The Blogger Guide. This is an official message from www.dailybookshow.com, entreating you to list your books and ebooks on our brand new site. But what is www.dailybookshow.com? DailyBookShow.com is a brand new website built by a group of authors and marketers solely to help writers and independent publishers advertise their published works. We hope to be the number 1 when it comes to book promotion and advertising. Listing of books on our site is presently FREE! So come list your books and get some massive exposure for your books." I checked it out and it looked okay by me. Whoever is running this, thank you for giving authors a chance to promote their books online! The Black Authors Network Radio Show is hosting 42 days of Black History and we would like to include you on the program. January 25-31, we are hosting seven days of Book Marketing On-line Workshops. I am contacting you today to see if you would like to conduct a hour long workshop, on-line, during this time. You can promote your book(s) or your services to the fullest! If you have any information that would drive people to your site or increase your book sells for your clients, feel free to provide it too. You may invite 3 other people to be on the 1-hour show with you if you would like. If you are interested in calling in for the exclusive 1-hour show, please let me know which night Sunday, January 25 - Saturday, January 31, 2009 that you would like to be on the show and what topics you will be discussing. The show will only have you and your invited guest as the presenters. I will only ask questions and conduct the chat-room. You can discuss any topics that you like, during the chat session and radio conversation. We want to cover all areas of book promotions, meeting the media, advertising on the Internet and how to be successful at literary events. Your contribution will be appreciated greatly. This is free of charge. You do not have to pay the $35.00 fee listed on the information page. You may call me if you would like more information at: 301-422-1730. Please join us for 42 nights of fun, wisdom, fellowship, and book previews, as well as author interviews. EDC Creations and the Sankofa Literary Society will host the annual Black History Month Internet Book Fair to bring together authors, community leaders and concerned citizens. You can participate nightly from the comforts of your home! The event is held totally online with nightly panel discussions, seminars, live readings from new book releases, community town hall meetings and open mic poetry nights. Our theme is "Give the Gift of Knowledge." We seek to bring together our modern day Griots to share with us the history of our people and to lead us into the future. Are you ready? Do you want to help us prepare an archive of African American legacies for your children? This is an open, community forum for all races and cultures. We will help create the very foundations of change by exercising unity! This was a very interesting and unique story which I wanted to share with everyone. Please click on the link to see her story. Ask a Publicist: How Do You Go About Getting Blurbs? Sorry for no post yesterday; I've been fighting off a nasty cold and sore throat. Fortunately, Ask a Publicist means that other people write the entries for me! Today's question: How do you go about getting blurbs? With Pyr, we tend to go outside our own list for blurbs, to friends of the author or people the author thinks will have an affinity for the book. Often the author pursues the blurb, though other times we might enlist authors that we think are appropriate. Lou Anders doesn't think a blurb on its own sells a Pyr book, but combined with a good description and cover, the combination can be very effective in helping a book catch the right reader's eye. On our nonfiction side, for Prometheus Books, we think blurbs can sometimes be extremely influential. One blurb ("I learned an enormous amount from this splendid book.") by Richard Dawkins, author of the New York Times bestseller The God Delusion, was incredibly influential in helping our book God: The Failed Hypothesis become a New York Times bestseller itself. The timing (when The God Delusion was huge) and the suitability (appealing to the very same science and religion and/or atheist readership) made it a perfect endorsement for garnering attention to our title. I'm pretty sure we, the press, requested that Dawkins blurb, but the author may have done so directly as well. And sometimes a blurb request results in more involvenment, like a foreword or a preface. Create a Google account for yourself and use their Webmaster Tools to ensure Google frequently crawls your site for new content. One of the most exciting tools they offer is the Sitemap tool-it's easy to create and will update as you add content to your site/blog. Welcome to another year! 2009! Of course, by this time, most of us are likely sorting through our collective shoe boxes of New Year's resolutions, throwing out the ones that don't make sense and trying to find time for the ones that really matter. If you're like me you've placed marketing at the top of your list. So, I'm dedicating this newsletter to Internet Marketing. Below you will find tips, tools, ideas and hopefully a little inspiration to get your 2009 marketing efforts off to a great start! Articles about Blogging are for the most part boring. It's the same story over and over: you should be blogging-blogging drives traffic-blogging is a great marketing tool.... And yet, most bloggers quit after a few weeks, or worse yet, never get started. There are a slew of reasons people have for not blogging: I don't have time. It doesn't seem to be doing my site any good. No one reads my blog? I don't know what to blog about. The truth is, blogging does help drive traffic, blogging will build your audience, and it will establish your name in the marketplace! The trick is this: you have to be patient and consistent. You won't see results right away, in fact, it can take up to a year before your blog builds a steady and loyal following-but it will, and that's the exciting part. Admittedly, when you first start blogging, it may seem like you are stuck on a desert island pontificating to the palm trees. Persevere!! Those smoke signals will reach your market eventually, and here's the best part: even if no one ever reads your blog, search engine spiders will. Here's how it works: the more you blog, the more relevant content (and keywords) you have for crawlers to index, and the more likely you are to appear on a search engine results page. Let's say for example you are trying to increase your ranking for the term "kids and guns." Google will rank your site for this term if it appears in your site frequently and it is relevant to the other content of your site. The best way to ensure relevance for this term is to blog about it frequently, but don't overdo it. Always blog as if you are speaking directly to your audience-if you say the same thing over and over, people get bored. Even if you don't think you have an audience now, you will. With this example, after a few months of blogging, your site might start to appear in the search engines for "kids and guns," and slowly people will start to find you, read your blog, and tell others about you. If your content is relevant to this topic, and you blog consistently, readers might subscribe to your RSS feed or book mark your blog. You see, it's not really about how many people are commenting on your blog-although it's certainly nice to get feedback. In the beginning, it's about creating content! You know that saying, if you build it they will come? Well, this is true, but you have to upkeep your blog by adding new content a minimum of once a week-otherwise the cobwebs will build up and no one will ever visit your blog. Believe it or not, Internet spiders and crawlers don't like cobwebs either (bad Internet humor). There are so many incredible blogging tools and easy ways to create a dynamic blog-below are ten of my favorites. Remember to only tackle the items that make the most sense for you and your schedule. 1. Setup Google alerts for your keywords (five to ten). This will help you research your topic, inspire you with new ideas, and also tell you what your competition is up to. Remember, it's okay to share your findings with your readers, in fact they will appreciate it if you do all the research and become their number one resource for valuable content. While your at it, setup an alert for your name-it's good to know what others are saying about you. 2. Join online content sharing sites like Digg. Here you will be able to find additional content. You can even post someone else's article to your blog, this is a function offered through the Digg membership, it's easy to use and a great way to populate your site when you are having trouble finding something to write about. 3. Create a FeedBurner account and add a subscriber button to your blog. This makes it easy for people to subscribe and you can track your subscribers too! 4. Offer a ShareThis function so people can both share and bookmark your blog posts. 5. Link your blog with your FaceBook account so your blog content posts directly into your FaceBook account, less work for you (it's best that your content appears in your blog first, so Google indexes your site as the originator-if your content appears elsewhere that's okay, but Google will not index duplicate content). 6. Create a Flickr account to store your photos and link them to your blog-this way your photo files are stored on Flickr instead of taking up space on your server. Another fun tool is called bookr: this allows you to create a photobook of flickr photos, but they appear as a flip book within your blog. Very cool. 7. WebResizer is a free online tool you can use to resize and crop your images for your blog and the best part is you don't need any fancy software, just log-on, create an account, and start editing. It's fun and easy. Be sure to optimize your images for the web so they load quickly-72 dpi is optimal. 8. Google Analytics is a fantastic program that allows you to easily track the traffic to your blog pages. Most hosting companies offer free traffic tracking as well. 9. Social Networking: mybloglog, Blogcatalog, and Blogarama are just three of the many social blog communities/directories available to you. 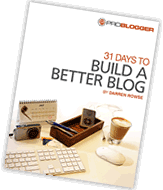 This a great way to increase your blog exposure and network with other bloggers. 10. Avoid SPAM. Kontactr is a free contact form service that generates a form for you to embed within your blog; it can be used with any blogging software. This helps you cut down on the amount of spam that you receive. For bloggers using WordPress, there is a WP contact form plugin that's easy to use. 1. Don't let your URL expire, make sure you know when to renew your account. Not sure? Look it up using a Whois service. 2. Is your copyright up-to-date? People will often see if your site is updated and current by checking your copyright date. If your stuck back in 2004, your audience may wonder if you are still in business. 3. Are you blogging? Make the commitment. Once a week is enough to make a world of marketing difference. 4. Bad Links: Check your site for broken links. Not only do bad links annoy your readers, but they stop the search engine crawlers dead in their tracks-when a crawler hits a bad link they back out of your site and move on. 5. Add new images: iStock.com is a great source for inexpensive images. 6. Change your colors seasonally-don't let your site get stagnant. Need some inspiration? Try this out. 7. Track your traffic to see where people are coming from, where they land, what they do on your site, and from which page they are leaving. Knowing the habits of your potential buyers will help you meet their needs. 8. Offer monthly coupons that can be downloaded from your web site (notify your audience through your newsletter). Constant Contact is a great way to manage your subscriber list, we use them for this newsletter. 9. Update your media page: Do you need a new head shot? Is your one-sheet up-to-date? Is there a press release you can send out to EzineArticles and post to your media room? 10. Create an author interview video for your web site. Video is a powerful way to extend your reach and touch your readers profoundly. We love creating video, check out our Author Book Videos. BONUS: Join FaceBook, Digg, and LinkedIn-all are great ways to network and increase your visibility. If I leave you with one piece of advice, it is this: Persevere, don't give up - blog, blog, blog! I know it can be daunting but the key is to not load yourself down with too many goals, pick a few that work for you and stick with them. Also - we invite you to call our office if we can help in any way. We offer blog tips, blog training and yes, if you need someone to get you fired up about the exciting world of blogging and Internet Marketing, we can do that too. Your definitive guide to building a web site that sells. Jeniffer Thompson shares in easy to understand language, savvy tips and tricks that will turn your web site into a powerful marketing tool. Order now and get the Web Site WOW book and E-book for one low price. E-books will be sent upon receipt of order. for web maintenance - regularly $85 an hour. So if you're ready to make some changes, now is the time-give us a call today!! Not Valid for new site projects or work currently in progress; discount applies to hourly work only.